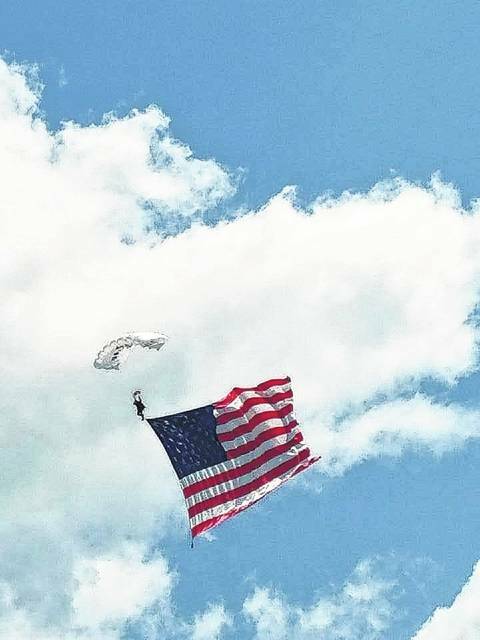 Saturday’s Fayette County Open House/Fly-In at the county airport Saturday included a skydiving show. Jolinda Van Dyke, the executive director of Fayette County Travel & Tourism, spoke Monday about the success of the Fayette County Open House/Fly-In at the county airport on Saturday. Van Dyke said that they had good participation in the morning 5K run, though she would have liked to have seen more, and around 80 kids received face painting from Mandy Miller and Creative Courthouse. Altogether, Van Dyke said it was the most well-attended open house for the airport in years. Fayette County Travel & Tourism would like to remind the community of several upcoming events. On Aug. 10 starting at 6 p.m. is Streetside 62 Bike Night, on Aug. 26 both the Brew Fest at Pour Boys’ Brew House LLC and Art on the Square will be held downtown, and in September the Scarecrow Festival will return from the 15-17. For more information visit fayettecountyohio.com or contact Jolinda Van Dyke at (800) 479-7797.
https://www.recordherald.com/wp-content/uploads/sites/27/2017/08/web1_Center.jpgSaturday’s Fayette County Open House/Fly-In at the county airport Saturday included a skydiving show.